Many travelers who visit the United States are unaware or unsure about how to tip there. Tipping can be misunderstood or feel overwhelming for visitors coming from countries where tipping is not customary. In the US, many workers in the service industry make as little as $2.13 an hour (called 'tipping minimum wage') and they depend almost entirely on tips for their salary. Here are some common tipping practices to follow when in the US. If the restaurant has waiters who come to your table, the standard tip is a minimum of 15% of your total bill (post-tax), with the typical tip being between 18% - 20%. Anything less than 15% is considered bad manners and an insult to the waiter. Why tip off the post-tax total and not the pre-tax total? Waiters are required to 'tip-out' on their total sales, including taxes. 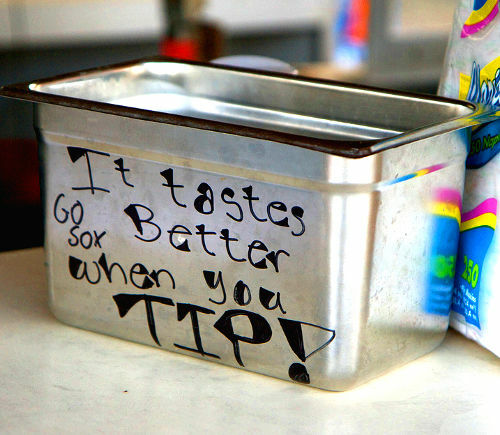 Waiters give a percentage of their tips (or ‘tip-out’) to bussers, hostesses and kitchen staff. This percentage is set by the restaurant. If you tip on the pre-tax total, the waiter still has to tip-out on the post-tax total. If you are dining in a party of 5 or more, many restaurants will automatically add an 18% - 20% gratuity onto the bill. If the restaurant or café does not have table service, there may be a tip jar on the counter near the register. Tips in this case are optional but still recommended. This is common at coffee shops and some less-formal restaurants. If your order is under $10, drop some coins in the jar. If it is over $10, it is polite to tip around 10%. It is customary to tip 15% - 20% of the total bar bill or $1 per alcoholic drink and $.50 per soft drink. If you have a drink or two in a restaurant bar before sitting down at a table, it is best to settle your bar bill before being seated. Remember bartenders, like waiters, only make about $2.13 an hour and are dependent on tips. If you order a meal in, pizza delivery, etc., the 15% - 20% gratuity is appropriate. It is customary to tip a taxi driver 15% of the fare. If your driver assists you with luggage or heavy bags, tip an extra $1 per bag. If your taxi driver goes out of their way to be helpful (giving you directions, local tips, etc.) it is not unusual to tip up to 20% of the fare to show you appreciate their kindness. For basic baggage handling the standard tip is $1 per bag. If you need special services or assistance (such as expedited handling at curbside check in at the airport) an extra $1 per bag or flat $5 - $10 (if you have a lot of bags) is appreciated. Baggage handlers include: porters, bell hops, sky caps, shuttle bus drivers and generally anyone whose job it is to lift or carry your luggage and bags. Room Service: The same guidelines apply here as in a restaurant or food delivery: 15% - 20%. Some hotels will automatically add this gratuity onto your room service bill. Housekeeping: In the US, it is customary to leave a tip for maids and housekeepers. Most hotels will provide an envelope in the room specifically for this purpose. Tipping $1 - $5 a night is common, depending on the quality of hotel you are staying in. It is also best to tip daily rather than in one lump sum as the same person may not clean your room every day. Porter and Bell Staff: Anyone who assists you with your bags is usually tipped $1 - $2 a bag. Doorman: You do not have to tip a doorman for just holding the door but if they help you with getting a cab or arranging any transportation, it is polite to tip a dollar or two. Tipping your tour guide 10% - 15% of the price of your tour is customary. It is appropriate to tip a valet $1 - $3 when they retrieve your car. These are general guidelines for tipping in the US. If you feel you received outstanding service or are feeling generous, tipping more is always accepted and appreciated. Unless there is an extreme case of misconduct, it is not a good idea to not tip or ‘stiff’ a service provider. If you feel you received very poor service, ask to speak to a manager or supervisor but still tip the minimum typically accepted for that service. Remember, people in the service industry are most likely making tipping minimum wage and therefore make almost their entire salary from tips alone.